Having focused exclusively on Industrial Power Quality for more than 70 years, Sola/Hevi-Duty offers the right products to intercept and correct industrial power quality problems such as blackouts and voltage surges. They offer the expertise to help choose the best products – whatever the zone within a facility, whatever the source and whatever the nature of the power curve distortion. Sola/Hevi-Duty specializes in identifying and providing industrial power quality solutions. Sola/Hevi-Duty has a history of product innovations and excellence in customer support dating back to the early 1900’s. They manufacture a variety of product solutions and offer expert advice. Sola/Hevi-Duty offers the broadest power quality line, including UPS, power conditioners, voltage regulators, shielded transformers, TVSS and power supplies. 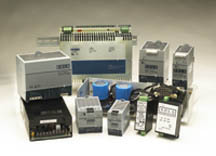 Sola has a broad range of standard power supplies to suit almost any industrial application. Updated approvals and user friendly features make power system design easy. 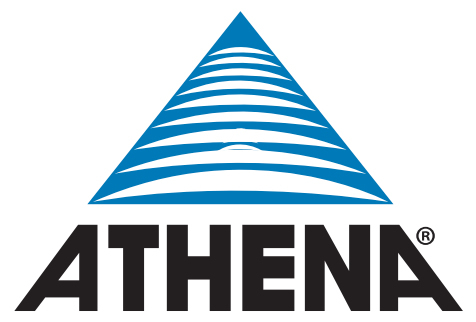 The product line includes one of the broadest ranges of DIN Rail and linear-based power supplies in the marketplace. The DIN Rail power supplies products feature full CE compliance (including all the elements of CE design engineers need to worry about: safety/LVD, EMC, and ingress protection). UL 508 approvals eliminate derating in UL 508 listed panel systems. Global inputs are available for installations around the world. Sola also offers a three phase input option on many of the SDN DIN Rail power supply products that convert 380/480 three phase directly to 24 VDC. They provide extremely stable, regulated low voltage without the need for a step down transformer, saving space and money. For the popular SL linear line, Sola leads the market by replacing time consuming solder connections with screw terminals. Ease-of-use is now combined with economy and extremely low noise. Sola/Hevi-Duty’s ferroresonant power conditioners protect equipment from all power problems other than a complete loss of power. They excel at tightly regulating voltage within ±1.0% for input variations up to +10%/-20%, provide superior noise attenuation and are designed to withstand the harshest electrical environments. With no moving parts, Sola’s ferroresonant power conditioners are virtually maintenance-free. Whether you purchase a Sola CVS, an MCR or an MPC, you can count on an average of 25 years of dependable service. Every ferroresonant power conditioner is manufactured to exacting specifications and subjected to rigorous quality control. Sola uses cruciform-type construction with precision die-cut shunts, gaps and spacings between windings. This design technique is superior to ferroresonant transformers utilizing E and I type laminations with loose shunts, gaps and variable spacings between windings. The cruciform-type construction provides more consistent electrical characteristics and quieter operation than other types of construction. Surge suppressor protection devices are an effective and economical way to protect critical, microprocessor based equipment from the damaging effects of transients. Transient voltage spikes can be generated externally due to lightning, utility grid switching and electrical accidents or internally due to copiers, generators and large motors. 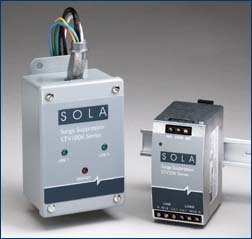 Sola surge suppressors quickly limit the high energy transients to levels that are safe for AC equipment. Sola/Hevi-Duty’s industrial surge suppressor / protection devices protect equipment with low clamping levels on all electrical paths. This not only prevents catastrophic failure but also extends the life of any electronic equipment. These surge suppressors meet UL 1449, 2nd Edition standards and provide AIC ratings for appropriate and safe distribution panel use. These surge suppressors / protection devices come in a compact design allowing the user to install the product as close as possible to the sensitive load. 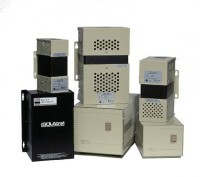 Surge suppression is one part of a total power quality solution. Surge suppressor products can be used alone or in conjunction with other Sola/Hevi-Duty products to solve more complex power quality problems. 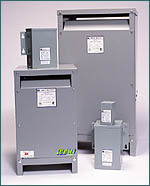 Sola/Hevi-Duty offers a wide selection of distribution and control transformers through 600 KVA. Designed to meet NEMA-TP1 standards. Sola/Hevi-Duty offers off-line, line-interactive and on-line UPS topologies along with software for seamless communications, monitoring and control. 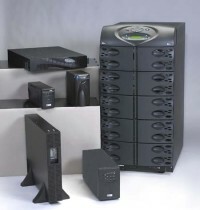 Off-Line topology (also called Standby) is a cost-effective uninterruptible power supply (UPS) choice for small, less critical, stand-alone applications such as isolated PLC, PCs and peripherals. Network communications are a useful option. Line-Interactive topology provides highly effective power conditioning plus battery back-up. This is particularly applicable in areas with rare power outages, but frequent power fluctuations. Network communications are available and sometime necessary. The On-Line alternative provides the highest levels of power protection, conditioning and power availability. True on-line topology is accomplished with double conversion technology. Network communications are often necessary to protect mission-critical applications.